From there, we'll focus on more horrible images, without professional photographers involved, that still have people fooled. Some of the most appalling violence displayed by other activists as part of the Houla Massacre, especially that done to children, is genuine; torn-off jaws and hacked skulls at least happened to kids that day. But some of that worst of the worst imagery in that category was added with more recycled images. 1) Mohammed Family: The "Examiner" for example includes in an emotive slideshow a particularly horrible (graphic!) 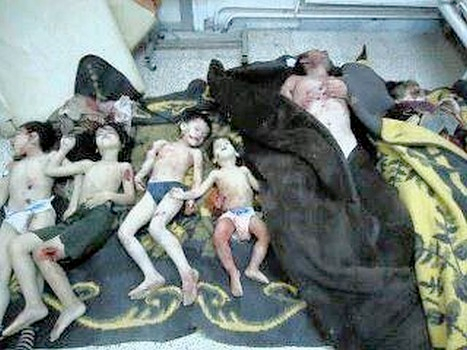 scene, captioned: "A family, all victims of the Houla massacre." In the video on youtube, you can hear the cameraman from the Free Syria army break into tears (courtesy of Days of Syrian Rage Facebook English Facebook page unless noted)" Actually, that's from from a mini-massacre in the dark days of Homs, January 30, 2012. This was in the Karm al-Zaytoun district of Homs city, they say say. Father, mother, four young children, mutilated, apparently tortured before death. 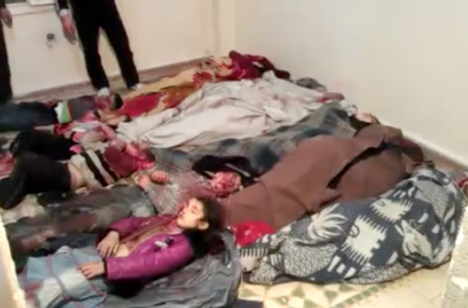 2) March KaZ Victims: One room full of men, women, and mangled children turns out to have been already aired after the March 11, 2012 Karm al-Zaytoun Massacre, same district as above. These extra-gruesome images have been used by both sides to blame each other for the Houla Massacre, and wrongly so (eg Vox Clamantis, Oweiss-Reuters, see below). A girl with her eye shot out/brain protruding, in a pink coat, is the most famous victim. If she's in the spread, it's from this massacre, with fascinating research backing it - see the link. Rebels are heard calling the KaZ victims "sheep" on one video, and it's said they were herded to one apartment in batches to be slaughtered. 3) Khaled al-Fares, May 17: VDC lists 10 Homs martyrs on May 17, including 5 from Houla (sub-town not specified). One is the executed pharmacist discussed here, shot or hanged, the rest killed by "shelling" A woman, a man, another man named (as given) Mohammad Al-Faris, and his possible son, Khaled Abdulkarim Al-Faris, age 4, mother's name Nafia. Of the "shelling" victims, only the last has, or had, supporting imagery. Video of the martyr video 1 (unavailable) - video 2 (private) - from elsewhere, another video (unavailable) - another yet at Daily Motion is still viewable, and could be the same child with shirt still on - dated May 17. It looks like his throat has been massively torn, and he lived long enough to stuff his hands in the wound and get that dismayed look on his face, which can be seen clearer in a set of two photographs. This image is what Alex Thomson must mean when he says a local man showed him video on his cell phone, “of two children, their throats slit so deeply they are virtually decapitated.” There are two famous photos of Khaled, looking almost like two different children. 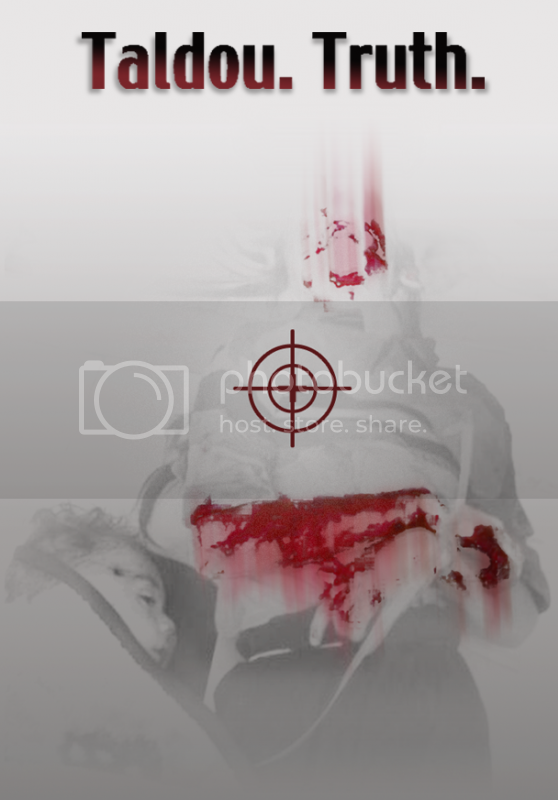 As once seen here, (now gone - still at this Kuwaiti forum post) there's also a photo where he's rolled over - he's got a serious wound in the side and middle of the back, plus little nicks all over from exploding fragments, maybe, and then the throat elimination. These moving images have been re-used many times since for subsequent Syria massacres, and according to this Urdu site, exposing efforts to use this to blame Shia killers in Pakistan, in November 2013, and sow fresh discord there. One wonders if it was used to rile up or inspire the Houla Massacre perpetrators a week later, as they tore the jaw-necks off at least two kids to a similar horrifying effect. This Houla local talking to Alex Thomson should know the video is from a week before the alleged Shabiha assault. Little Khaled did have a possible relative - Osama Fares - killed on the 25th in the Houla Massacre (first listed as killed by shelling, later changed to field execution - unlike Khaled), possibly on the militant side, possibly not. But Khaled was not slaughtered May 25, but on May 17, less likely by "shelling" than by, say, a claw hammer. We do not know who, in rebel-held al-Houla, would have done this, nor why. That sounds like Khaled al-Fares. A Houla kid, but killed a week earlier and not to worry, by "shelling," not "Shabiha." There's a similar-looking girl in Houla, but covered. The blood down the right side clarifies he's talking about the famous pink-coat girl from the Karm al-Zaytoun scene. 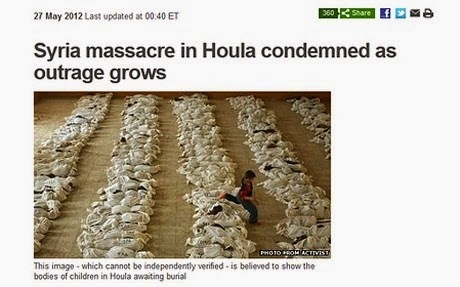 Oddly enough, the report citing that photo for the wrong event was titled "Families herded "like sheep" to die in Houla massacre." - when - and this is worth repeating here - rebels are heard calling the KaZ victims "sheep" on one video, and its said they were herded to one apartment in batches to be slaughtered. Despite the event mismatch, the title and one cited picture wound up lining up pretty well. Another Double-Whammy: Lebanese forum A Separate State of Mind shared Houla victim photos that inluce the KaZ scene (third row, middle) and Khalid (fifth row, middle). The picture to the left of Khalid is also questionable, but hasn't been pinned to anything else yet. Their second batch of photos seems to be all legit. Add: Government loyalists do it too. 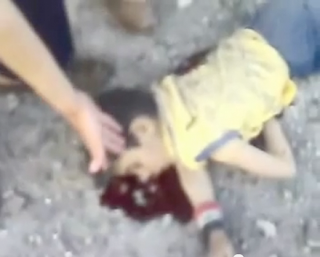 This picture of what appears to be a boy from a loyalist family, from a video, has been widely pushed as a victim of the Houla Massacre. It was even considered by the UN's CoI (see June, 2012 report) as evidence for possible rebel guilt over the events of May 25. However, he's a victim of an April 5 Houla Massacre, about 6 weeks too early, as early postings and contemporary records bear out. The stricken home is geo-located in Taldou, east of town center. Rebels blame the government side for this as well, but clues suggest it was the rebels who killed this loyalist family. An uncle of the Farouq Brigade's Abdulrazaq Tlass (a leader of the May 25 attack) was killed in fighting in the "Houla countryside" at this time.